The St Leger Stakes is a Group 1 flat race that is scheduled to take place in September every year. Hosted by Doncaster Racecourse, the race is run over 1 mile, 6 furlongs and 132 yards in total. It is open to three-year-old thoroughbred colts and fillies and is the oldest of Britain's five classics - along with the 2,000 Guineas Stakes, 1,000 Guineas Stakes, Epsom Oaks and the Epsom Derby - having first been run in 1776. With a prize purse of £650,000, it is unsurprisingly one of the most prestigious events on the British racing calendar and is the final leg of the British triple crown, being preceded by the 2,000 Guineas and the Epsom Derby before reaching Donny in September. The fastest race time in the event was set in 1945 by Stanhope Joel’s Chamossaire, whose time of 2’ 55’’ remains unbeaten to this day, 71 years after the feat was achieved, although the fastest time at Doncaster remains Masked Marvel in 2011, with a time of 3’ 00’’. In recent years, jockey Andrea Atzeni has dominated this particular event, coming out on top as the winner in each of the last two years. 2014 saw the Italian storm to victory on Kingston Hill, while Simple Verse matched his achievements of twelve months prior to make it back-to-back wins at the famed track. Not since Lester Piggott in the 1970s has any jockey won the St Leger Stakes three years on the trot, with Piggott claiming victory between 1970-72 and was an eight-time overall winner of the event, although is second to nine-time winner Bill Scott in terms of record victories. 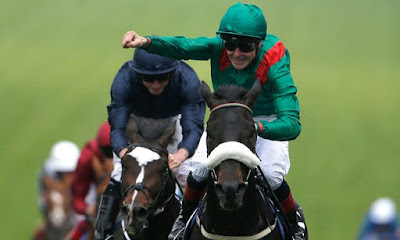 In recent times, Frankie Dettori has had great success in this race with three wins in four years (2005, 2006 and 2008), while trainer Aidan O’Brien has had four wins this century in the race. This year’s race will take place on Saturday, September 10 in what is already looking an extremely close-fought and competitive field heading into the race. Here, we will give you some of our racing tips for what is set to again be one of the showpiece events of the calendar year. Currently the favourite at time of writing at 5/1, Harzand’s recent sparkling form justifies his position as being odds-on to win here at Doncaster. The three-year-old has continued to impress over 10 and 12 furlongs in 2016, winning four from four races this calendar year as we approach the St Leger Stakes. Ridden by jockey Pat Smullen, the pair have really struck up an excellent understanding this year and trainer Dermot Weld will certainly have high hopes for him going into this one. A versatile horse, the conditions are unlikely to affect Harzand who has won on soft and heavy ground already this year. Aidan O’Brien trained US Army Ranger has had a big impact in the racing world despite his inexperience. Making his debut only in April of this year, O’Brien will be delighted with the way he has taken to racing, winning two from two with Robert Moore in the saddle. For the Epsom Derby, however, despite being the favourite, US Army Ranger was pipped by rival for this upcoming race Harzand. Despite the disappointment of coming second, expect his team to be fired up in trying to get back at the horse who denied him victory so recently and to come back strong. A rank outsider at 14/1, Muntahaa could be a decent each-way bet if his form is anything to go by. Running on flat, the John Gosden trained horse has four top-three finishes from four races, with the field in each race containing a minimum of nine runners in total. Despite winning only one race to date, Muntahaa’s consistency should be noted and as far as an outside bet goes, currently stands at extremely good value. In truth, this really does look like a two-horse contest between Harzand and US Army Ranger and will be difficult to split the two, with the former having the benefit of the doubt after his victory over O’Brien’s horse at the Epsom Derby. Muntahaa may not be an obvious choice given his winning record but the consistency he has shown throughout his short career to this point can’t be written off. Ultimately, I think this is Harzand’s race to lose given his recent form, although you can never have any guarantees in a 22-man field. Article written by Dean Carr of Cheltenham Tips.